For more than 50 years, elevated uric acid has been treated with a drug that reduces its production via inhibition of an enzyme, xanthine oxidase. However, almost 75% of patients in randomized Phase 3 clinical do not respond to these drugs. 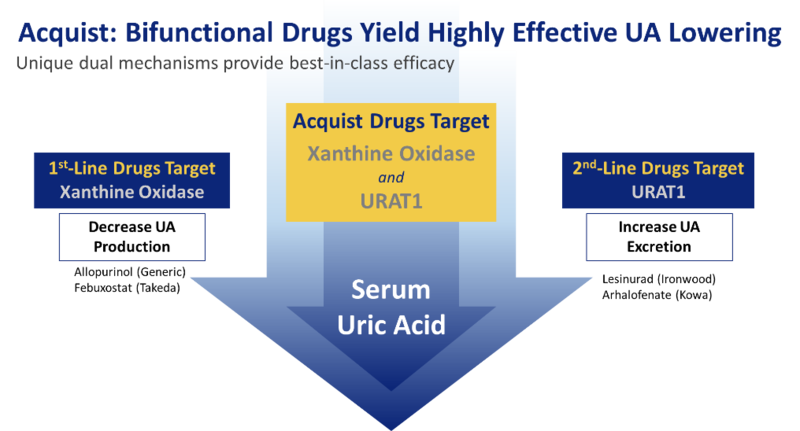 In such patients, a second drug has been added onto the first drug, which increases urinary excretion of uric acid by inhibiting another enzyme, URAT1. Nonetheless, this dual therapy still yields a clinical failure rate of approximately 50%. In our discovery research, Acquist found that marked uric acid reduction with RLBN1001 owed to bi-functional inhibition of both enzyme targets – a unique effect never before described. Equally important, the inhibitory level of RLBN1001 and its novel derivatives against each target exceeded the standard agents that inhibited only a single target. We believe this highly potent activity will considerably improve clinical response rates, as well as provide substantial benefit to patients with inflammatory diseases.